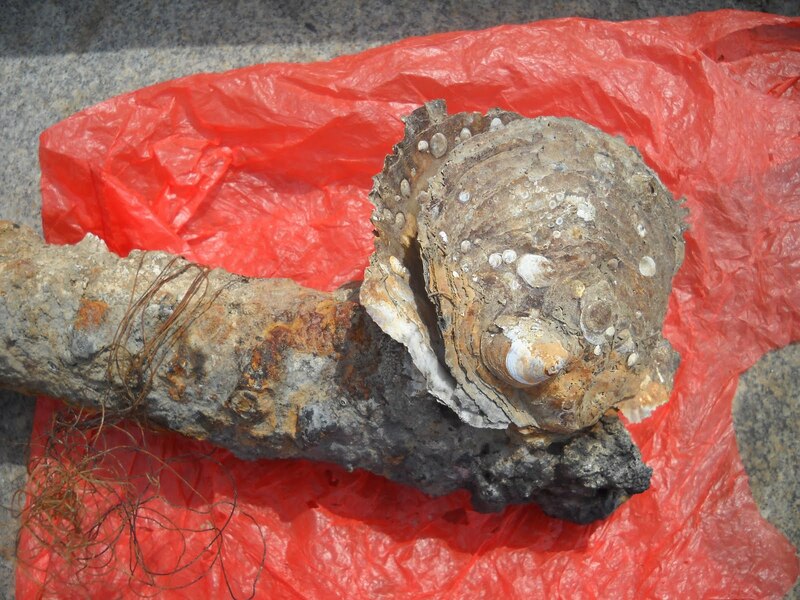 Professor Anamarija Frankic of UMass Boston forwarded these photos of a live European Oyster that she found it on the Quincy side of Moon Island in July. The European Oyster (ostrea edulis) tends to live in deeper water than the Eastern Oyster that we are working to restore. The European oyster was imported to Maine in the 1950s for aquaculture. We have heard that they were accidentally released from a Massachusetts North Shore aquaculture facility when the wrong valve was mistakenly opened. A 1997 survey revealed dense concentrations of O. edulis in Salem Harbor, Danvers River, and Manchester Bay (Salem Sound). Lower densities were observed north to Cape Ann and south to Boston Harbor. They continue to be harvested in Casco Bay, Maine. In the Northeast, O. edulis appears to occupy a different niche than the native oyster population, and it is yet to be determined if there are ecological impacts. We have seen O. edulis shells throughout the harbor and our divers had even found one at the mouth of the Charles River. Below is a picture of one Mat has found on a May dive. The New Yorkers are a bit ahead of MOP in that they have been able to get an upweller in the water to raise oysters, while we have not been able to overcome all the barriers to doing likewise. We have an ongoing dialog with people driving the oyster restoration effor there and occasionally compare notes. Interestingly, when we hosted a group from the big apple here in February they were impressed with the vitality of our harbor. Over the next week, we will again be active measuring oysters to generate more data on their growth. There also will be another major dive/measurement on July 18th. Several have already volunteered, but a few more people would make it go even easier.